Modern custard tarts are usually made from shortcrust pastry, eggs, sugar, milk or cream, and vanilla, sprinkled with nutmeg and baked. 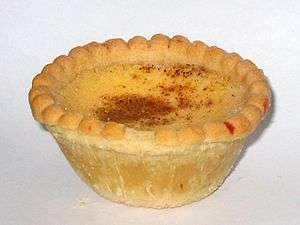 Unlike egg tarts, custard tarts are normally served at room temperature. 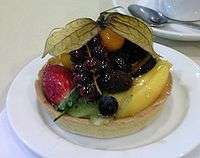 They are available either as individual tarts, generally around 8 cm (3.1 in) across, or as larger tarts intended to be divided into slices. Variations on the classic recipe include the Manchester tart, where a layer of jam is spread on the pastry before the custard is added. Other versions may have some fresh fruit, such as rhubarb, cooked into the filling. Versions topped with elaborate arrangements of fruit show the influence of French pâtisserie. ↑ "Custard tarts recipe". foodtolove.com.au. Retrieved 18 May 2016. ↑ "Custard". Oxford English Dictionary, Second Edition. Oxford University Press. 1989. Retrieved 14 December 2007. ↑ Matterer, James L. (2000). "Daryols". A Boke of Gode Cookery — Medieval Recipe Translations. Retrieved 14 December 2007. ↑ "Baking for Britain — Custard Tarts". 2006. Retrieved 15 December 2007. ↑ "Great British Menu — The Winning Menu". 2006. Retrieved 14 December 2007. ↑ Bird, Fiona. "Recipes: Rhubarb and custard tart". Masterchef. BBC. Archived from the original on 16 January 2008. Retrieved 17 January 2008.